Basil essential oil is a type of essential oil commonly used in aromatherapy. Sourced from the Ocimum basilicum plant, basil essential oil is said to offer a variety of health benefits. Basil essential oil contains a number of compounds thought to enhance health. These compounds include linalool, a substance shown to reduce stress in several scientific studies. Its Botanical Name is Ocimum basilicum. Blends with - Bergamot, clove bud, clary sage, geranium, lemon, lime, hyssop, eucalyptus, juniper, neroli, rosemary, marjoram, melissa and lavender. Benefits - The benefits of basil essential oil are Cosmetic Applications, Digestion, Illness, Respiratory, Infections, Stress Disorders, Blood Circulation, Pain Relief, Eye Health, Vomiting and Nausea, Itching and Blending. Aromatic Description : Sweet, herbaceous, licorice-like, slightly campherous. 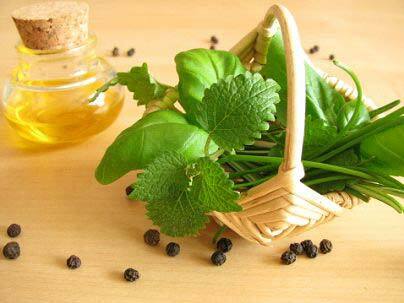 Basil Oil Uses : It is used for inhalation, in baths and for massages. Having both cold & hot qualities, when it is used in bath or is smoothed over the body, it has invigorating effect that is very beneficial for sluggish skin & pepping up circulation. When combined with other oils like Thyme, it also acts as powerful antiseptic.